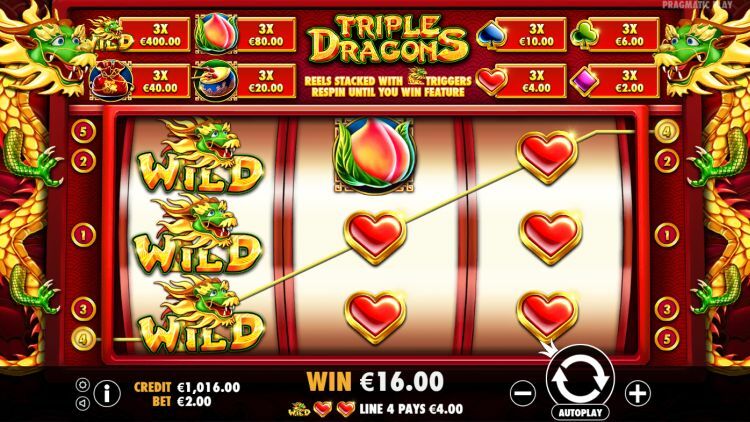 Triple Dragons is a classic three reel slot by Pragmatic Play with a lucky Oriental theme. There are some modern features in this slot as well. The design, for example, is fantastic. The colours are just awesome, and the symbols are drawn beautifully. Also, you will find an exciting ‘Spin until you win’ bonus feature. The stacked wilds are held until you win a prize. 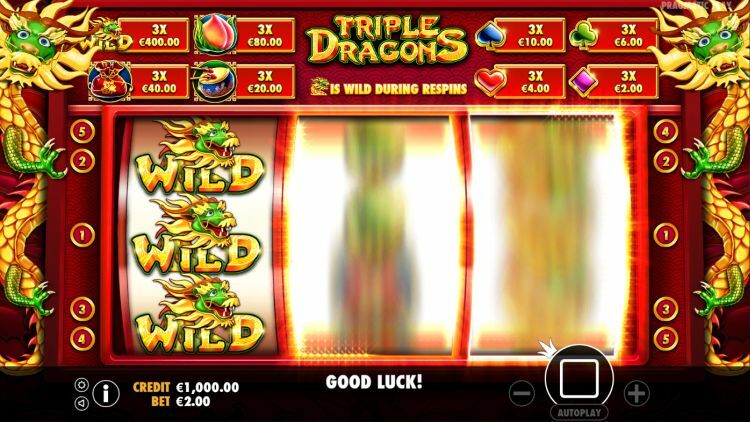 How does the Triple Dragons slot work? Triple Dragons is essentially a very simple slot. There are three reels with three rows of symbols, and you always play with five fixed paylines. You can start your bets with $€ 0.05 up to a maximum of $€ 50 per spin. Do you want to increase the high rotation rate? Press the spacebar for a turbo spin! The variance is high. 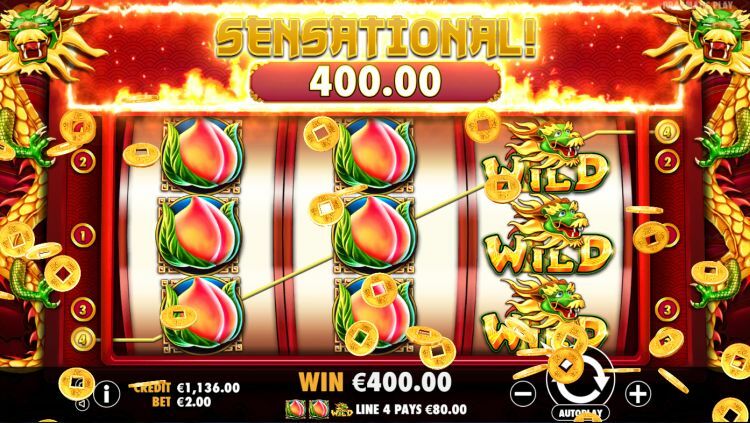 Although the maximum profit of 1.000 x your total bet is not very spectacular; the other prizes for slot Triple Dragons are predominantly high too. The Wild Respins make it relatively easy to get a full screen with the same symbols. The theoretical payout rate is great: 96.52%. We’ve told you already: this is a very simple slot: there are only 8 symbols in the game, which look vibrant and colourful. Kudos to the Pragmatic Play design team. Three dragons at an active payline will give you a payout of 60 x the total bet. The dragon can also occur as stacked wild. When you have three stacked wilds on a payline, you will get 200 x your total bet. A full screen of wilds gives you 200 x 5 = 1.000 x your total bet. Other premium symbols are the peach (40 x the bet), the gold bag (20 x the bet) and the drum (10 x the bet). The card symbols spades, clubs, hearts and diamonds are worth between 1 x and 5 x the bet. Stacked wilds: spin until you win! When one reel with stacked wilds appears, the only bonus feature of the game starts working. You will get free respins while the wilds are held, until you win a prize. Although this is a very simple bonus feature, it is very effective. You will win at least one 3-of-a-kind, and often you will win multiple winning combinations. We have already managed several times to get a full screen with high paying symbols, with payouts that amounted to up to 200 x the total bet. That feels very nice; we can tell you that! As far as we’re concerned, Pragmatic Play can crown itself the king of slots with an Oriental theme. Somehow, they always release Oriental slots, and they keep surprising us with excellent bonus features. You would expect them to get a little tiresome at some point, but that point has not been reached yet. This Triple Dragons is “just” a top release again: it looks nice, the pace is high, and you can win a lot. Finally, we would also like to mention the excellent payout rate of 96.52%. Where can you find Triple Dragons? 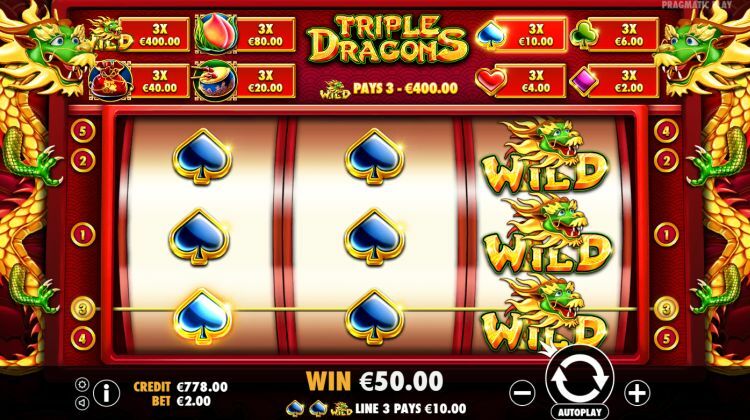 The Triple Dragons slot is found at all reliable Pragmatic Play casinos. One of these Pragmatic Play casinos is Casumo, which is one of our favourite online casinos. 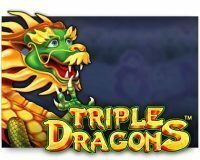 You can play the Triple Dragons slot at Casumo with a 200% bonus up to $€50 plus 200 free spins.